Ohio has been having crazy weather, as usual. After a freakishly long winter, an almost non-existant spring and a taste of summer, spring finally arrived wet and chilly in the middle of June. Oy. When we finally got a day that was warm and rain free, I just had to celebrate with a bright outfit! I just adore my patio dress and I'm on a mission to wear it loads this summer. I grabbed the opportunity for a shoot on the playground when I saw it was momentarily kid free. Tada! 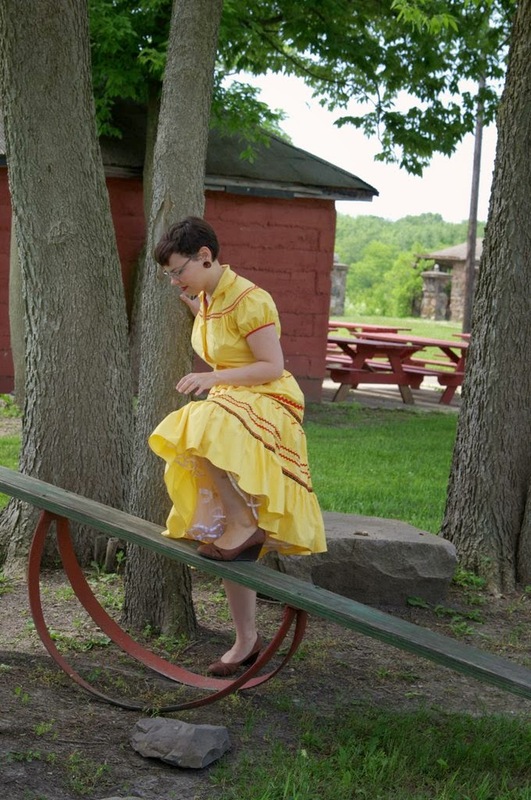 For some reason, I thought it would be a fun idea to balance on the see-saw in my wedges. I didn't end up getting hurt so I guess it was an ok idea after all. 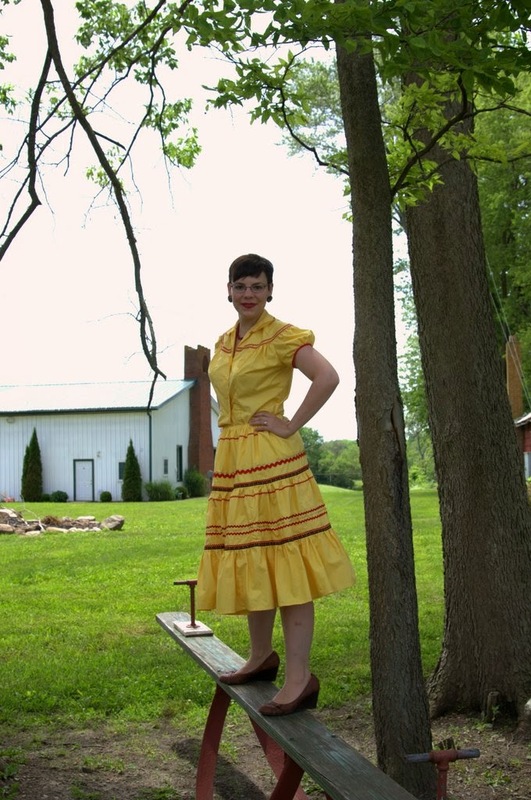 I actually made this patio dress from some old curtains that used to belong to a friend. They were moving and didn't want them any more. So I loaded up on vintage ric rac and whipped them up into a playsuit. I pretty much stay in the same styling box when it comes to this outfit. But it's so loud on it's own that I don't think it can really handle too many accessories! Do you have a patio dress? 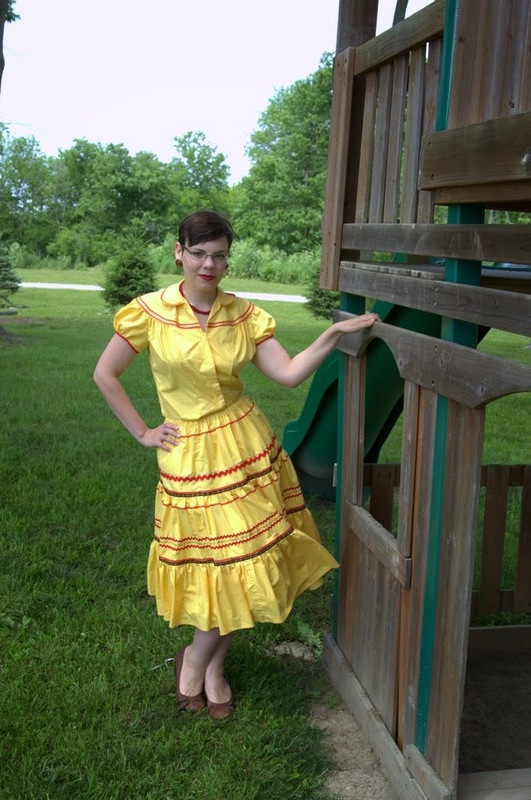 You are sunshine that's been eluding your area in this fabulous yellow patio dress! There isn't a scene or mood this great vintage frock wouldn't perk up. I just love the rick rack and the color! Perfect! So cute! 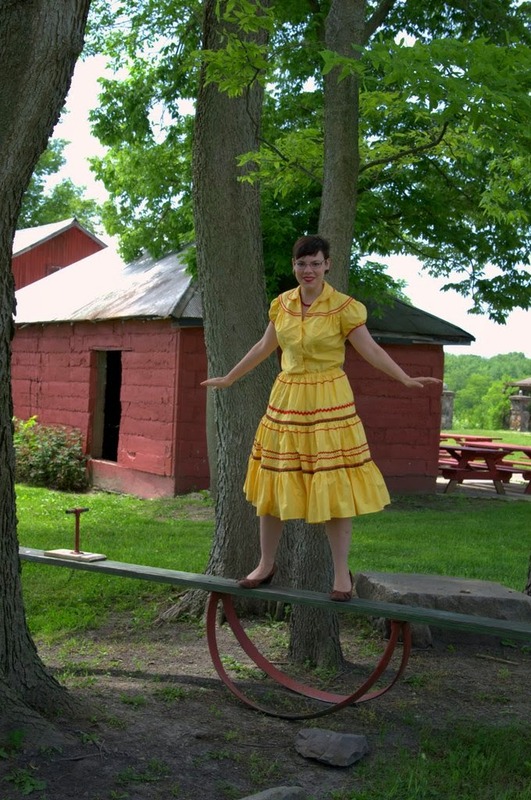 And on the see/saw in wedges, what a feat! I have some patio dress patterns and thought about making on this summer, but I doubt I will have time... But I love them so much! Summer is in full swing here after a very mild winter and very warm spring, so maybe after finishing my playsuit, there's still some time to make a patio dress as well. Yellow is not my colour, but I love it so much on you - looks great with your hair! 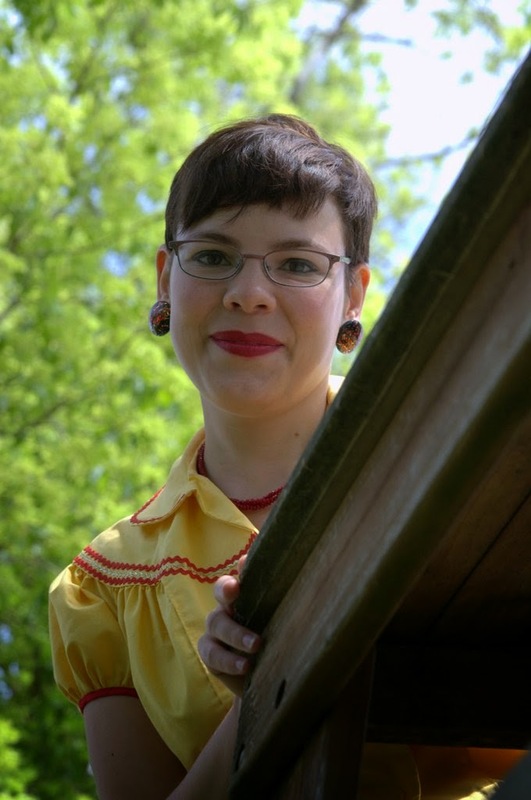 And I love particularly the blouse, what pattern did you use? It's lovely! Did you use cotton roc-rac? What a darling patio dress! And how brilliant of you to make them from old curtains! And, yes, I have like five! I adore them! I love it! It's so cute! And how much better to have made it out of curtains! You're like a southwestern 1950s Scarlett O'Hara!